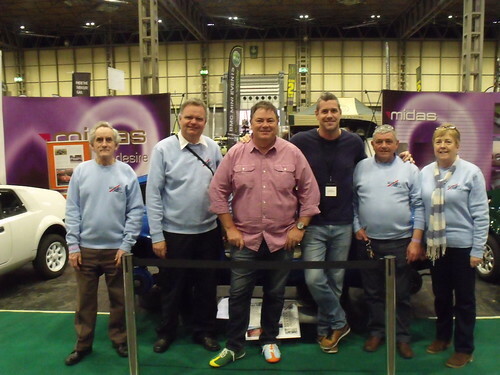 The club has been offered at stand at the Practical Classics show - Practical Classics Classic Car & Restoration Show, with Discovery 23 – 25 March 2018 at the NEC Birmingham - to give it its full title and Tony is keen to repeat the success of last November. 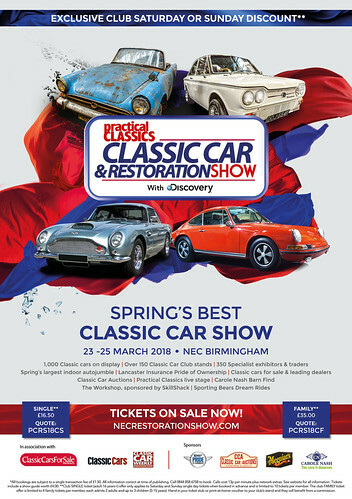 The Practical Classics show is slightly smaller than the Classic Motor Show, but thanks to the promotion it receives from the magazine it has a very high profile. Tony has arranged for a stand that is slightly smaller than we had last November and we already have the cars to fill it with. Once again we will need some volunteer helpers. All volunteers will get free entry tickets, lunch and a Club sweatshirt. Helping out on the club stand is a good way to visit the show. The stand activities are never too strenuous and the stand itself provides a good base for sorties out to look around the halls. If you have never helped out at a club event before this could be a good introduction. The club sent out an email last night with the show discount codes. The keen eyed will have spotted the codes in the post above. All set up and ready for the show to open tomorrow morning. That was a very busy and worthwhile weekend at the NEC. The club stand was in an excellent position, close to the Practical Classics Stand and right behind the Grippaz Glove stand where Mike Brewer and Ant Anstead spent a lot of time signing autographs and posing for photos - guess whose flags and purple stand backdrops can be seen in all those photos! Those photos and many others can be found on the Midas Cars Facebook page, which seemed to be buzzing all weekend. 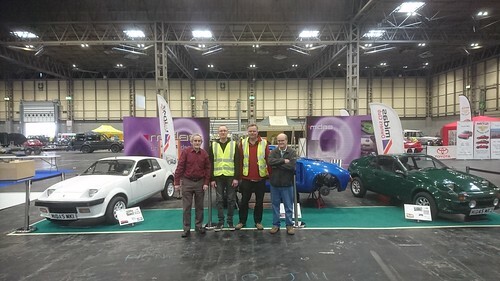 It seemed that Midas owners who couldn't be at the show themselves were following our progress with interest and also posting up photos of our stand found on other pages. The club has to thank Tony Moss for dealing with the organizers and getting us our passes; Neil Franklin, Roy Forrester and Desmond Gorman, for allowing us to show their cars and also helping out on the stand; Meredith and Janet Phillips for helping out on the stand every day, plus James Courtney and Susan Gorman who helped out on a couple of days each. So the next event for the club is Stoneleigh, which is all about Midas Owners and their cars. Hope to see you there. Yes, a very quick mention. However, it does illustrate how our stand was noticed by many passers by and seems to have had a lot of social media coverage, mainly people including photos of the stand in galleries of others taken at the show. Certainly more coverage than the show last November. It was an enjoyable few days at the show and a pleasure to help out on the stand.